Real world trade union solidarity - the picket at GEA. 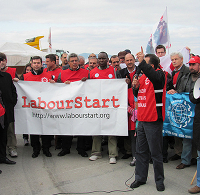 Ten days ago, a couple of bus-loads of trade union activists from around 30 countries paid a solidarity visit to the picket line of locked-out workers at GEA, a German-owned metal company in Turkey. We’ve now been asked by the International Metalworkers Federation to turn this into an online campaign, and have done so this morning. We thought the solidarity picket was very exciting and tried to share some of that excitement with comrades who couldn’t be with us in Turkey. It will be interesting to see if we can keep up the momentum, turning a real-world act of solidarity into an online one. We’ve also today launched a campaign in support of jailed Pakistani trade union leaders – at the request of the ITGLWF. As we’ve launched three campaigns in less than a week, we’re going to stagger the publicity to our mailing lists — and will start with the IMF Turkey campaign. I was invited to Gottingen, Germany yesterday to give a talk at a conference with that title. My talk is here. It was a great opportunity to begin building bridges with the German trade union movement, as the event was organized by their foundation (the Hans Boeckler Stiftung) and I was on a panel with two German trade unionists, one from the national center (DGB), the other from the ILO. All this is very important in the run-up to the LabourStart Global Solidarity Conference due to be held in May 2014 in Berlin. We should aim to grow these numbers over time. You might find this piece of some interest. Less than 24 hours after launch, both jailed trade unionists are now free. I’m announcing this to our correspondents first, then to our lists. Not only do we now have campaigns in Japanese, and regular mailings in Japanese (both thanks to Mac Urata) but we now also, apparently, have a news page on LabourNetJapan. 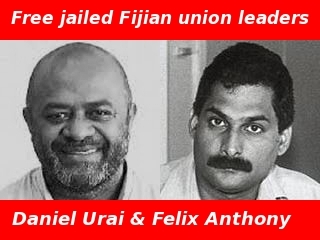 At the request of the ITUC we’re closing the current Fiji campaign and launching a new one today. The previous campaign, launched in late August, was our second largest in 2011 and one of the very largest we’ve ever done, with well over 7,000 messages sent and over 2,000 recommendations on Facebook. Let’s hope the current campaign, which is being rolled out over a few days, can beat that and lead to the release of the union leaders. * Nearly all the mailing lists are growing – some quite dramatically (the German and Spanish lists, for example, over the last couple of months). * As for social networks, there’s now a virtual tie between the number of users of UnionBook, the members of LabourStart’s Facebook group, and our followers on Twitter. At the moment, the Facebook group is the largest – by 4 people. But it suffered a net loss in members this month, while UnionBook picked up about 100 new ones. My guess is the UnionBook or Twitter will lead next month. * We continue to pick up several members each week for our LinkedIn group, which we barely use and never promote. We’re now up to just under 500 members. If any of you are very active users of LinkedIn and are keen to take charge of this, let me know. * At our current rate of growth, we’ll be at 1,000 LabourStart correspondents by the end of February. At that point – or sooner – we might want to begin to purge the list of inactive ones. * There was a massive increase in traffic to the site in October – page views alone were up about 30% compared to September. And on a peak day, we’re now getting over 24,000 unique visitors.